Join us for a night of visual arts, live performance by AfriCaribe and also a special performance by Master Folklorist Roberto Cepeda and Gloria López de Cepeda. Expresión de BARRIO is a traveling exhibition featuring a selection of paintings made by Puerto Rican artist Reynaldo Rodriguez. 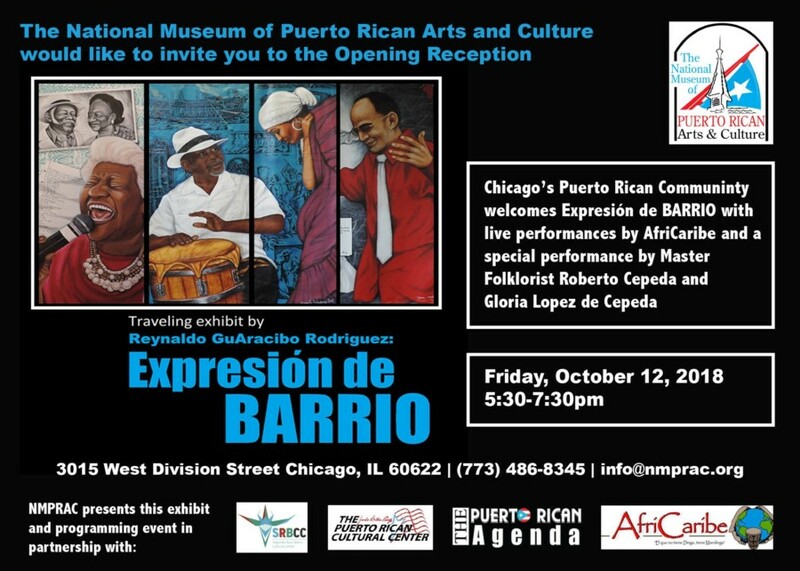 This exhibition explores the West African, Caribbean and the Puerto Rican history of the bomba tradition in Chicago and others parts of the United States. Each large-scale painting depicts a colorful image accompanied by the sounds & rhythm of Afro-Caribbean drums and dances while highlighting different members of the bomba community. The artist portrays some of the most important bomberos in our community and each painting represents various aspects of our bomba music like: drumming, singing, cuá, maraca, and the call and response that compose this music genre. An important element in this exhibit will be the connection with bomberos from Puerto Rico and the United States. Consequently, selected bomberos from Puerto Rico and other provided the context to these pieces by writing letters describing their influences and their first experience with bomba as well.